Chocolate Zucchini Muffins made with whole wheat pastry flour and agave instead of sugar. A delicious way to start or end the day. My family is crazy about zucchini bread, so I decided to make the zucchini bread recipe in an agave cookbook I’d been sent. My kids love the Costco chocolate muffins, so I also changed up the recipe and added chocolate. I didn’t want to wait 50 minutes for a bread to bake, so I made muffins instead. In addition to the cocoa in the batter, I sprinkled chocolate chips on top to add an extra layer of chocolatey goodness. The batter is more the consistency of a cake batter than a muffin batter – a little bit runny – but they baked up light and tender. As with many quick breads, they were more moist the next day. The recipe makes 24 muffins, but they should freeze well so don’t let that deter you. Preheat oven to 325º. Spread two muffin tins with cooking spray with flour, or line with paper muffin liners. In a mixing bowl, whisk together flour, cocoa, baking soda, baking powder, and salt; set aside. In a large mixing bowl, combine eggs, agave, zucchini, oil, and vanilla and mix well. Add dry ingredients to wet ingredients and mix just until blended. Divide batter into 24 muffin cups and sprinkle tops with chocolate chips. Bake approximately 20 minutes. I love zucchini and chocolate together. These muffins look delicious and I bet I couldn’t stop at just one. I’ll take one with a cup of tea right now please! These look so yummy–another great way to use up zucchini. Can you buy the whole wheat pastry flour or do you grind the wheat yourself? 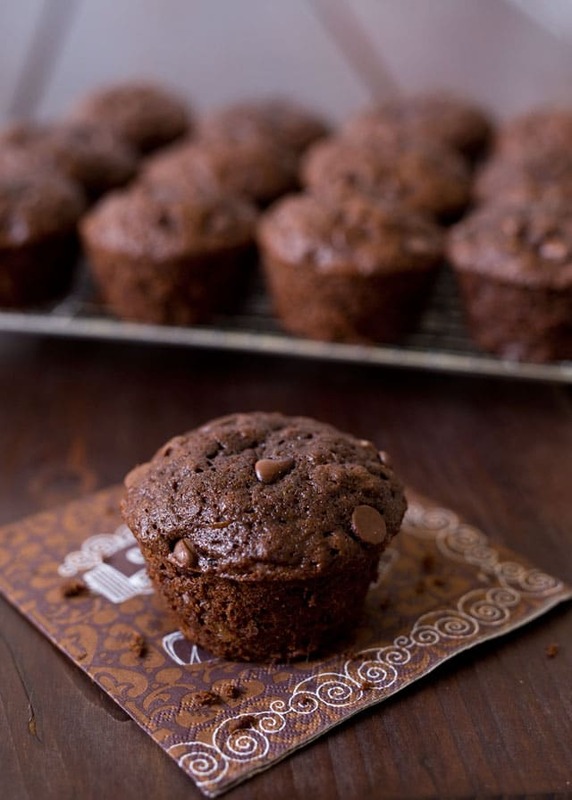 Like your kids, I am also a huge fan of the Costco chocolate muffins–guess I’m saving this one to make really soon! Thanks for sharing, Barbara! AWESOME! Would you believe my garden is STILL producing zucchini? Good grief! This recipe couldn’t have come at a better time. 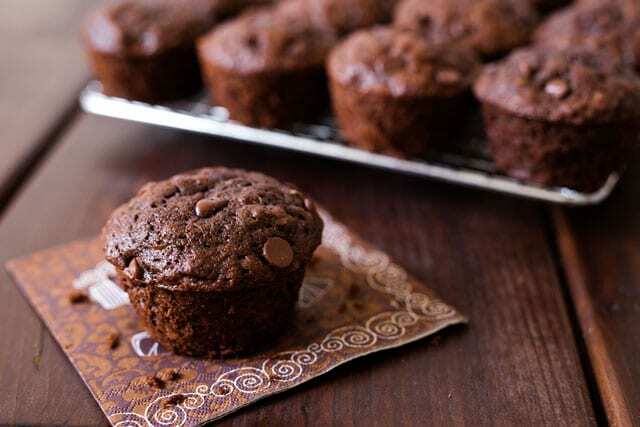 Chocolate muffins sound divine-and I love that it uses whole wheat pastry flour too-another ingredient I want to use up.